Introducing Momma Chef: Bringing you fabulous recipes using less than 6 ingredients and under 6 minutes of prep time! How easy is it to make dinner while holding a 4-year-old on your hip, calming a 7-year-old throwing a tantrum and helping a 12-year-old with his homework? Sound familiar? Well I have finally mastered a way to serve a fabulous meal with little effort and few ingredients. My recipes are simple and delicious, using no more than six ingredients and under six minutes of prep time. It will look like you’ve spent hours in the kitchen with help from Momma Chef. Now that winter is in full swing, most kids are happily playing in the snow. But here’s one way to get rid of the snow – eat it! Try my recipe for homemade “snow” cones. It’s made with real outdoor Ohio snow and homemade syrup that takes just minutes to make. Your kids are going to love being in the snow and eating it with this yummy recipe! Remove from the stove and divide the liquid into two bowls. In one bowl, squirt about 8 drops of Kool Aid Liquid cherry. In the other bowl, do the same with the grape until desired color. Put the bowls in the refrigerator until the liquid is cold. 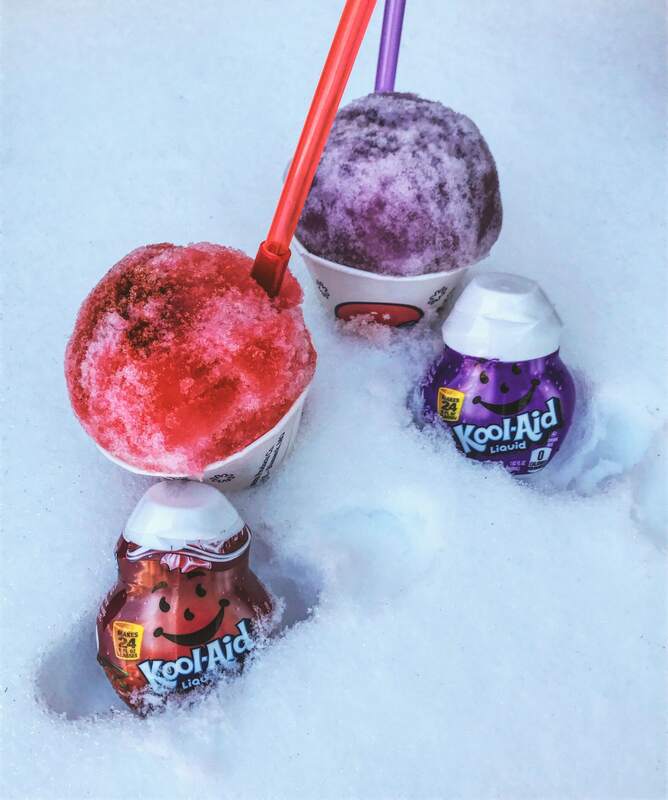 When it’s ready, take your kids outside and have them scoop about 10 cups of fresh snow into a large container (this will make about 5 snow cones). Make sure it’s clean snow! 1) My kids like to use a spoon and straw to eat their homemade snow cones. 2) Remember snow melts fast, so enjoy these treats right away! 3) The syrup is good for 10 or more snow cones. When finished, store any leftover syrup in an air-tight container in the refrigerator for up to two months. I am a mother of three active boys (ages 12, 8 and 5). Although I often feel like I’m struggling with some aspect of parenting, my one sanctuary is the kitchen. My children like different foods and constantly request a variety of things for dinner. Over time, I figured out a way to make dishes they all love by developing easy, quick recipes. That led to the creation of my blog, Momma Chef, for parents like me. My recipes are simple and delicious, using no more than six ingredients and under six minutes of prep time. It will look like you’ve spent hours in the kitchen with help from Momma Chef. Find more fabulous Momma Chef recipes at www.mommachef.com.